Big V/s Fast Data? What Makes Them Vital for Cutting Edge Businesses? Conventionally, starting any small business always involves some amount of capital and other expenses to sustain it. And for many would be businessmen or entrepreneurs the bottleneck is ever the lack or shortage of funds to manage their ambitious ideas and plans for online business solutions. But, what would it really take to have some business at the outrageous assumption of low budget plans? Since the advent of ecommerce, there are many ways to start an online businesses with the least scratching of one’s head. Yet several aspiring entrepreneurs need big budgets in order even to consider starting. There are many emerging trends in businesses that can be good pointers to invest and have robust and booming business. Starting an online business is the best way than any other industry with little capital requirement. 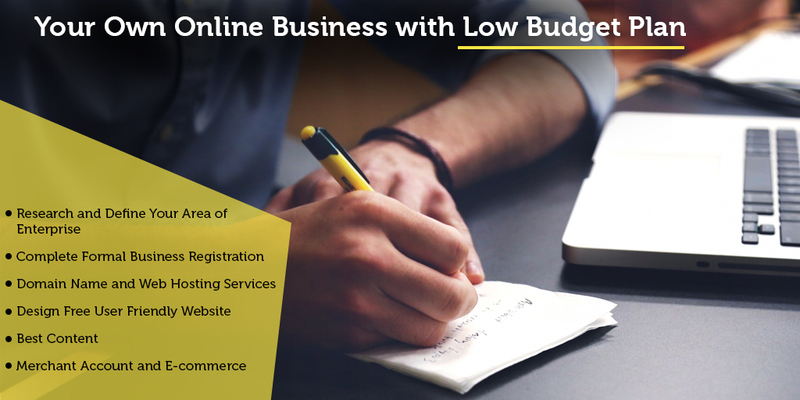 Beginning/ starting online business with low budget plan is plausible with cautious business plan and constant push for success. What makes many businesses to fail is lack of proper business plan that ideally states; what is the business all about?, what types of goods or services is it offering clients, what is its viability, level of competition and profitability, proper business plan, size of market, production and shipping costs, level of taxation, future prospects in terms of expected trends and a lot more. Research breaks makes everything visibly clear for further business planning and execution. Having seen the problems caused by ambiguity in business plans, the best foot forward is to ensure a name for business through proper registration channels. This brings attention to the fact that your business exists with stringent and systematic adherence to government and statutory norms just like for all other commercial undertakings. It’s good to foreclose potential for legal complications through registration and necessary paperwork for the online business. There are a range of free domain registers and web hosting service providers for online businesses. Choosing a resonant available domain name is vital. Popular, likable, with a ring of ease to it may be faster to recall. The best option is for convenient and suitable web hosting offered at various levels of affordable packages to suit easy payment terms. Intriguingly, there are many online services offering sign up for free website building service with great website ideas for beginners. There are also several domain suggestions, templates and ways to make fully functional attractive business websites for target audiences. Free templates enhance website look, appearance, easy to understand and fine tune for personal preferences. ‘Content is king’ is a common adage. Be it home, about us, services and products, photo gallery, contact us etc pages should resonate with target client interest and your specialization. Product or services portfolios make your goods known by one and all easily. Creative presentation wins customer hearts and inspires curiosity to find out more. Modern free e-commerce software and merchant accounts on shopify, pinnacle cart etc help handle online payments like credit cards and establish online stores etc. They are platforms for online transactions free from fraud especially for new online businesses.